Web apps provide a quick and easy alternative to native applications when playing mobile online pokies. While they function much the same as the market apps found at the Apple App Store and Google Play, these lighter versions require no downloads and take up next to no space on the hard disk of your smartphone or tablet. Read on to find out just how easy it is to make an Internet pokies app for iOS and Android casinos, as well as your favourite individual mobile slots titles. A Web app – also called an Internet app or browser app – is essentially a bookmark which links to a mobile pokies casino. But instead of having to open up Chrome or Safari and type in URLs or trawl through all your saved pages, browser applications give you direct access to your favourite real money pokies by tapping a thumbnail icon on your phone or tab’s home screen – just like any market app. So what’s the difference between a Web app and a native app? First and foremost, native applications are small executable programs, whereas an Internet application is simply a link to a Web page. Secondly, native apps need to be downloaded and installed via markets like Google Play and the App Store, whereas we make Net apps ourselves by visiting a casino’s mobile page and following a few simple steps. This is the key reason for taking the Web app route – for while native pokies apps are great, they can be very hard to come by. Royal Vegas Casino is of the precious few mobile casinos which offers a licensed app for the Australian market, whereas you can create a browser thumbnail for any mobile slots site. When you make an Internet app, it appears instantaneously on your mobile’s home screen. When you go in for a market app, on the other hand, you have to wait a minute or two for it download from Google Play or the App Store. This is but a minor inconvenience, to be sure, but one which sway more than a few folks in this age of impatience and instant gratification. Smartphone apps are changing all the time, with new features and improved performance to keep up with the advancements in mobile software. As such, native applications need to be updated on a regular basis. Web apps, meanwhile, require no such process, because they are not executable programs – so whatever upgrades the casino makes, we get them automatically without having to install any software updates. While modern mobile technology is paramount to magic, even the most advanced smartphones and tablets suffer a few limitations. One of these is hard drive space, especially with some of the older iPhone models. As Web apps are basically hyperlinks dressed up in a thumbnail icon, they take up none of those precious megabytes – which means more space for unwanted U2 albums (or much cooler stuff). We’ll use Guts.com to show you just what a sinch it is to make browser apps for iPad, iPod Touch, and iPhone pokies. Open Safari and pull up the Guts Casino website. See the navigation bar at the bottom of the screen? Tap on the ‘Action’ button in the centre (the one with the arrow pointing out of a box). Select ‘Add to Home Screen’ from the bottom row of options. Name the app whatever you like, then hit ‘Add’ in the top right corner of the display. Et voila – that’s it, you’re done. If you exit Safari and look at your home screen, you should see a thumbnail icon with the Guts logo on it. From now on you just have to tap that and it will take you straight to the Guts.com mobile casino. For this little demonstration, we will call on All Slots Casino – one of our top real money casinos for Microgaming mobile slots. Open Chrome (or your alternative browser program of choice) and head to All Slots. Hit ‘Tap Here to Play Now’ in the centre of the home page, then tap the menu button on your Android device. Select the ‘Add to Homescreen’ option from the menu. Name the app (something like ‘All Slots Casino’ would do just fine) and tap ‘Add’. Now if you head out of Chrome, you should see the All Slots icon among all the other Android apps on your homescreen. And that’s all there is to it – now you just have to tap the All Slots thumbnail to open up the mobile casino interface. 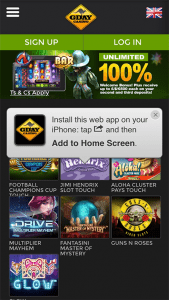 The Ace in the hole for Android browser apps is that we can create direct links to our favourite real cash pokies games. So instead of loading up the casino lobby and scrolling through dozens, even hundreds of online slot releases, we can simply tap an icon on the home screen and it will immediately open up our game of choice. To do this, open up the casino lobby and tap on whichever title you want to make a Web app for – anything from Avalon to Xcalibur. Once the game starts loading, press the menu button and follow the same steps listed above for the Google Android operating system. When you’re done, return to the homescreen and click on the icon you just created. The game should launch straight away. It doesn’t get much more convenient than this, folks. 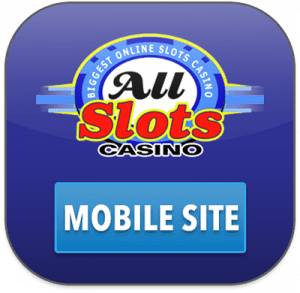 To play mobile pokies on the go, we recommend Slots Million to create a flawless Web app where you have one-tap access to hundreds of the best slot games on the Web.